Anti Aging Skin Care: Are Eye Creams Just Rubbish? In terms of anti aging skin care around the eyes, the top problems most older people will complain about are getting rid of puffiness, dark circles and wrinkles. And you could easily spend some serious money for a product that does nothing for you. We give you some surprising facts about eye creams from consumer trials, an overview of some of the controversies, and an in depth look at one of the new ‘miracle products’ for dark circles and puffiness. We hope this thought provoking guide will give you more idea when it comes to shopping for eye creams to help you beat back time. One way to judge whether any product works is to read consumer reviews. Individual reviews will of course, only reflect one person’s skin reaction to one particular product – and their expectations coupled with how much they paid. A better indicator is mass trials, like those found in popular newspapers and magazines. One survey worth mentioning is the amazing results of the UK’s Daily Mirror Beauty awards, in 2009 (1). Their number one mass market eye cream was astonishingly, a super cheap supermarket brand (Tescos Derma+). Reviewers liked its cool sensation and in blind tests, thought it was a higher end product retailing at around £20 (around $13) – it sold for £2 (around $3) a tube. Next was a paraben free product retailing at £8.99, (around $12.50) again, not a high end product and then there was the jaw dropper of the lot. Readers in the UK will be familiar with Aldi – a store so cheap, none of its brands are remotely recognisable, where for years you had to pay in cash only and it among the first to charge for grocery bags. A little like the runaway fast fashion story of the UK’s Primark, which has won awards for its fashion, most of which retails for under £10 (around $6-7), scarily regardless of the garment type, Aldi’s own brand £1.59 (around $2) anti aging eye cream scooped the third prize. A word of caution though from America’s ‘cosmetics cop’ Paula Begoun, on the cooling effects of creams. Paula busts the myth that any cream, lotion or other product that causes tingling or cooling sensations is working effectively. Instead, she characterises the skin producing those sensations in reaction to the cream as a local irritant. Paula echoes Giselle Mir, founder of Mir cosmetic line, in saying that over time irritation is ultimately damaging to skin and produces more markedly aged looking skin. Which is precisely the opposite of what those eye creams were sold to do. Another revelation from Paula is that we may all be getting sold hokum buying separate eye products. Paula reckons that if a face cream is of good enough quality, it should be safe and effective to use on the skin around the eyes. She feels that consumers are simply paying too much by purchasing separate eye area skin care products. One ingredient touted as the answer to dark circles under the eyes is haloxyl™, a chemical compound patented by the Sederma company. It is advertised with a variety of opinion as to what it is it actually does. It is described as something that loosens and then eliminates darker blood pigments, and in some reviews, it even absorbs such pigments. The skin under the eyes is thin, which explains why you can see blood pigmentation there. It’s listed on sale as water, glycerin, steareth-20, N-hydroxysuccinimide, chrysin, palmitoyl Oligopeptide, palmitoyl tetrapeptide-7 – yes, a whole bunch of chemicals. It is worth noting hydroxysuccinimide, may act as an irritant. Brands using haloxyl™ include ‘Elite Serum’ (which we’ll come to in later, RRP $99/ around £62) , ‘Skindoctors’ (around £32.95/ around $50+), ‘Serious Skin Care Hi Bright’ (around $32.95/ around £20), and ‘Purity Dark Circles’ (around $32.95 / around £20). Again and again, resellers promote Sederma’s stated research of a 19 – 45% reduction in dark circles and puffiness in tests. What’s interesting about this product is its easy to buy as an isolated ‘active ingredient’, which does raise the question of consumers trying to save a few bucks with home chemistry –for a product that’s going near the eyes! Not recommended without professional training, to say the least. 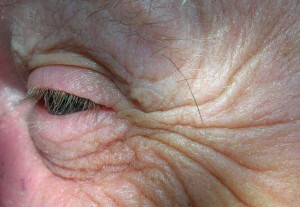 Another patented product being bandied about is ‘Eyeliss™’, made by the same company. This compound also claims to be able to reduce dark circles and puffiness under the eyes. ‘Eyeliss™’ apparently contains something along the lines of water, glycerine, hesperidin methyl chalcone, steareth-20, dipeptide-2, palmitoyl tetrapeptide-7. Both ‘Eyeliss™’ and ‘Haloxyl™’ are using “peptide technology” – but what exactly does that mean? According to Drs. Dahen and Gruenwald, writing for a company selling them, peptides are short chain proteins which in essence, are used to programme skin cells to behave in certain ways (2). Within anti wrinkle formulations, peptides will typically aim to make maturing skin produce more collagen, the elastic fibre that keeps skin young looking. Aging skin produces less collagen as the years go by, so this would seem a desirable effect. The “technology” term is being used to describe the way peptides, short chain proteins, are synthesised to produce specific, local effects. Within eye creams, acetyl-tetrapeptide is being touted as having an effect on lymphatic flow, with a corresponding reduction in edema – meaning puffiness (2). Which brings us to the ‘Elite Eye serum’. Its worth noting that even the glowing ABC film makes reference to the holistic lifestyle of the healthy, smooth skinned octogenarians featured in the Japanese village, including their diet and lifestyle! Although Japanese manufacturers appear to be selling extracted hyaluronic acid in pill form, it may be that scientists are still discovering why it appears to exert some protective effects. Advocates of traditional medicines, such as herbalists, often take pains to point out that each herb contains a complex variety of chemical compounds that act synergistically together to create the herbs effects. Not only that but within traditional Chinese medicine, for example, herbs are most often used in formulas containing up to 20 herbs, creating thousands of compounds. Alongside the chemicals, there is also aloe vera and acia berry. Both have been promoted as natural ‘wonder’ products, for skin healing and anti aging. Aloe vera is well known for its use as a soothing gel for sunburn, but not as well known for its applications in joint disorders such as arthritis. Along with many natural products, its efficacy is not a view endorsed by the mainstream medical community. Acai berry is another modern dietary supplement, sold nowadays as tablets, juices, powders to make drinks or as whole berries. 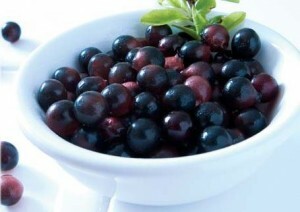 It contains a moderate level of anti-oxidants, which are themselves the source of controversy within the scientific community as to whether or not they play an important role in anti aging and disease prevention. This is not to say there are not benefits from the berries, but again, like aloe vera, their acceptance by the mainstream medical community is still developing as more evidence emerges; at present, it is probably best described as not widespread. As well as these two naturally occurring ingredients, its then back to the ‘science in jar’ approach. GABA, an inhibitory neurotransmitter produced in the body, tends to be associated with its relaxing effects on the nervous system. This is included to apparently relax the muscles and skin around the eyes. Reservatrol is also included, which is currently being studied for its effects on anti aging and cancer. It exerts eostrogenic effects and occurs naturally in foods, including peanuts, and some dark berries. Its interesting to note that much of the marketing for this eye cream features more or less the same copy, although in some senses this to be expected. There isn’t reference on the company website to the studies on the product or its ingredients other than a roundup of the results. Dark circles can result from a number of factors, such as poor sleep patterns, diet, stress and to some degree genetic factors. It may be worth tackling modifiable factors as part of healthy approach, as, sometimes skin can be telling us the body isn’t having all of its needs met. In the meantime, its also interesting to note that although there are anti aging eye products at the higher end full of newer compounds, there was still popular praise form real life consumers for those creams retailing for as little as £1.59 (£ around $2). And even then, as we’ve mentioned, theres at least one high profile cosmetics guru who says not to bother at all, just use good quality face products! Disclaimer: As ever, any serious puffiness or other symptoms around the eyes, or other edema, in fact any new symptom should always be investigated by your doctor. Thanks. My link, do you like http://rtyfvnn.bloginthedark.com/ ,Thanks again…. Thanks. My link, do you like http://bcxdmjg.blogdumps.net/ ,Thanks again…. My life,vist it http://blogs.hoycinema.com/xiangcai/2011/09/02/the-modern-style-for-any-spring-wedding-can-be-reached-using-the-following-colors/ ,Thanks…. My life,vist it http://xiangcaidress.lovelogger.com/pepe-le-pew-wedding-cake-topper/ ,Thanks….